It feels like we just had elections... oh wait, we did! And this board has been happy to serve. We need to get back to a regular election cycle that coincides with our fiscal calendar... July - June. I think most of us will agree that we want a vibrant, strong, and healthy Synagogue on Maui. There has been so much change in the past 6 months or so, and I know that it has not been easy on many of us for different reasons. It is now time for all of us to come together and remember that we need our synagogue for prayer, for holidays, for our youth, and for our community. We may not agree on everything, and that is ok. What is important is that we have a synagogue to serve our community; Your synagogue. And we need all of us to make it a success. Be part of the election process to make sure we have a synagogue of which we are all proud to belong. It's up to us. Nominations are now open! Send in your nominations here. You must be a member and signed into your account to make a nomination. As of Tuesday, April 9, 2019, the JCM kitchen has gone through a strict koshering process and has been converted for cooking meat in the kitchen for Passover. The kitchen doors will be locked, and there is no access. We have a few things upcoming prior to Passover, and our kosher kitchen will be strictly enforced. We have a variety of attendees in our shul over these next few weeks, and we are committed to our Kosher for Passover kitchen at this time. Thank you for your cooperation in this matter, and we will report back when it has been turned back into a Dairy Kosher kitchen. This week we read the portion of Shemini, the third portion of Vayikra, Leviticus 9:1 - 11:47, and the portion of the red heifer (Parah) Numbers 19:1 - 22, commemorating the purification before Passover. The portion of Shemini completes the story of the dedication of the sanctuary. Beginning after the giving of the torah at Mt. Sinai, this story has spanned many months, numerous chapters, and countless details - from the contributions of each member of the congregation to the creation of the vessels, to the anointing of the priests, and the first gifts and sacrifices. The mishkan, the sanctuary, is finally complete, and the fire is poised to descend from heaven to the altar, to signify to the Israelites that the moment of union has come. Their gifts are acceptable; their work is complete; their love is reciprocated; and the presence of the Shekhina now dwells among Israel. But at that very moment, two of the holiest members of the congregation, two of Aaron's sons, most perfect in all of their qualities, come forward with "a foreign fire, which was not commanded." Leviticus 10:1. Suddenly, the fire which was meant to the beacon of faith, the beginning of a new perspective, is transformed into a destructive force and the priests are consumed (see powerful artistic depiction here). And Aaron is left in a state of shock, between life and death, between the deepest mourning and the needs of the nation and congregation who have appointed him, the requirements of his role as high priest. This story has always been one of the greatest paradoxes in the Torah. Were these priests guilty of a sin? Of entering the sanctuary drunk (Rabbi Ishmael, Second Century Sage), or of disrespecting Moses (the opinion of Rabbi Eliezer), or of inventing a new sacrifice that took them into the holy of holies (Vayikkra Rabbah)? Or were they simply overstepping their bounds, reaching the peak of ecstasy that a human body can no longer contain? Can any of these explanations satisfy us? Can we simply explain away this type of tragedy? In the face of this loss, Aaron is silent. (10:3). He offers neither explanation, nor outburst. As a truly religious person he simply allows himself to feel, but does not question, does not seek to undermine, nor does he disintegrate: he simply continues with the acts necessary to heal and to live. Several months later, on the day of atonement, Aaron is asked to officiate in the holy of holies. The ritual of the day of atonement is prefaced with the words "after the death of the two sons of Aaron." 16:1. Why? An immediate parallel is drawn between the day of atonement, Yom Kippur, and the day of the dedication of the temple, when the two sons of Aaron died. The meaning behind this parallel eludes us: Because there is always something that cannot be explained, even many months later. There is something about Nadav and Avihu's death that cannot be healed, but it must be healed in some fashion nonetheless, just as we cannot truly change the past, but we can transform ourselves on the day of Atonement. And something about the death of these two young men, who died at the peak of their lives, in the holy of holies, for no apparent reason, resounds with the same mystery as the mystery of Atonement itself, which is a celebration of life, and transformation, and continuity. This week we had the privilege of having the visiting scholar Holly Hawkins, whose insights on death and mourning at the heart of Jewish tradition inspired us, and I encourage each person who is interested in further learning on the Jewish perspectives on dying, burial and mourning to reach out to her. I also encourage readers to read the powerful derasha here ("the deepest response of love"). Mahalo to Cynthia Lebowitz for leading a reform-style service on Friday night this week. Services will begin at 6pm, and we look forward to a different service this week. Cynthia has been co-leading services recently, and we are grateful she will be able to lead this week. It has been fun to have some variety in our services these past months, and we are sorry for the short notice...if you have been waiting for a more reform service, don't miss this week. Family Friday Shabbat is now the third Friday of every month. And this week - March 15 - is Family Friday Shabbat for March! Everyone is welcome for an evening of community and fun. Come with kids or if you love the energy of a kids service. All are welcome. It is our goal to have a service everyone can attend, eat dairy-Vegan potluck with the community, and go home for a normal bedtime. Josh Kalkstein and Cynthia Lebowitz are putting together an incredible service for our keiki and families with songs, prayers and fun learning! Our service will start at 5pm, then candle lighting with our Dairy - Vegan Potluck. All Food will be kept outside. We would love your participation to make a dish. Keep Kosher guidelines, no shrimp, no pork, no meat. Service - with singing great for all ages - especially kids! 6:00pm - Regular Kabbalat Shabbat in the sanctuary led by Shayna Nechama Naveh. AND HE CALLED UNTO MOSES — This implies that the Voice went on and reached his (Moses’s) ears only but all the other Israelites did not hear it). The call is the moment of beckoning. There is a need for explanation here, because we have completed one book, and begun another. There is a pause, of indeterminate time, between the end of the book of Shemot (Exodus), when the pillar of cloud descends upon the sanctuary, and the revelations of this book, Vayikra(Leviticus). Moses could not enter the sanctuary because of the cloud (Exodus 40:35), so a call must precede his entry. But the call is also the expression of affection, the sweet intimate call of love. It is the call of the Angel to Abraham to prevent the sacrifice of his child, "Abraham, Abraham" (Genesis 22:11), or the call to the sleeping child Samuel in Shiloh, "Samuel, Samuel" - the whispering voice to this young boy who has not yet discovered he is a prophet (I Samuel 3:1-10). It is a voice that is only heard to its intended one. What does it mean by the Voice? It was the Voice that is so minutely described in Psalms, (29:4, 5) “The voice of the Lord is powerful; the voice of the Lord is full of majesty. The voice of the Lord breaketh the cedars. But if this be so (that it was a very powerful voice), why does Scripture state, “[and the Lord spoke to him] from the appointed tent” (מאהל מועד and does not state באהל מועד)? Because it intends to tell us that the Voice broke off and that it was heard only in the tent). Thus, the voice has a double nature: inside the tent, it is omnipotent, thunderous; outside of the tent, it is not heard to anyone. It drops off. It reaches only Moses alone, as a still silent whisper, to awaken him and call him inwards. Once he enters the tent, it is the Voice of majesty, the Voice of the all powerful one. Is it only Moses who hears the Voice? The entire people look to Moses; but Moses's wish, his message, to Joshua his most prized student is "Are you jealous for my sake? I wish that all God's people were prophets, and that the God would place his spirit upon them!" (Numbers 11:29). Moses wishes for everyone to hear the Voice. Because it is so. Some have a moment of experiencing the booming voice of the creator of the World, the Voice that breaketh cedars. But each one of us has a moment of the still small voice, the voice heard only from within, that utters our name to us, and calls to come forth, to act in the service of the most high. May we always be guided by that voice, and seek it out. 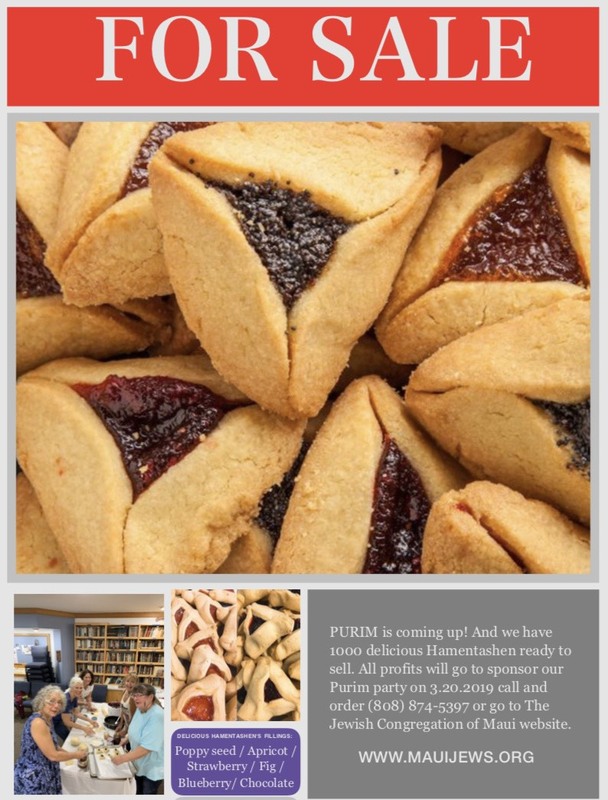 Celebrate Purim with delicious hamentashen, baked by your Beit Shalom Sisterhood from pastry chef Elinor David's family recipe. Now available for purchase in boxed sets of six hamentashen in assorted flavors: poppy seed, fig, blueberry, strawberry, apricot, and nutella. Order now here, or call Beit Shalom 873-5397. Pick up your order at Beit Shalom. 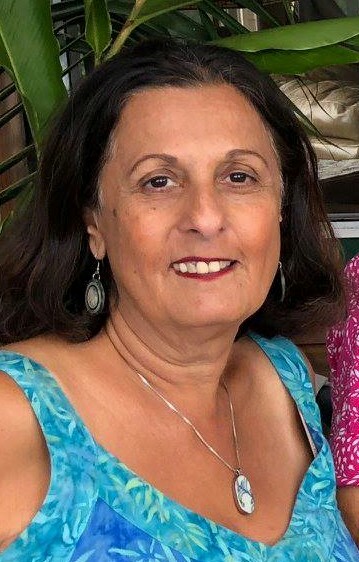 Please join us for a special Shabbat luncheon on March 16 to honor Jenni Ezekiel as an Eishet Chayil/ Woman of Valor, and to say goodbye to her. Jenni is moving to Oahu and this is our last Shabbat with her...for now. This event is being sponsored by Gail Schell, but an RSVP would be appreciated so she knows how much food to prepare. Please RSVP here. Israel's first lunar landing mission is on its way to the moon! The mission codename is "Beresheet", the first word of the Torah. This word is commonly translated into English as "In the Beginning" but kabbalistically has many deeper layers of meaning. For more information on the mission, see Space Israel's website. Leych b'shalom (go in peace), Beresheet! Come to our first Family Friday Service with Dairy-Vegan Potluck! Sam Schnider and Cynthia Lebowitz are putting together an incredible service for our keiki and families with songs, prayers and fun learning! Our service will start at 5pm, then candle lighting with our Dairy - Vegan Potluck. All Food will be kept outside. We would love your participation to make a dish. Keep Kosher guidelines, no shrimp, no pork, no meat. We will have a labeled Kosher section. Please RSVP in the comments or to jessicapearl@mac.com and include the ages of the kids that will be coming. We need to have an idea of what is needed in terms of challah, grape juice and candles so please, please RSVP! Welcome to the new JCM blog! This will be a space for us to communicate what is happening in our shul and in our community. The new Board committees and I are working on updating our website- adding content, updating our calendar, and creating this blog among lots of other things. To kick off this new section of our website, below is my letter from the newsletter from last week. Our new Board of Directors is off to a busy start. We are setting up committees and having initial meetings to create some structure! Look for information soon on how you can sign up to be part of the exciting future at JCM. I went just a few days ago to the Zionismus exhibit at the Nisei Veterans Memorial. It was such a moving exhibit, and Judith Elam did an incredible job, and it was wonderful to share our history with our Maui community. I met a non-Jewish family there with whom I had a great conversation , and I don't know why I was surprised that they attended the exhibit and had such interest, but I was surprised. It was a reminder to me that our community has so much to offer and share, not just among ourselves, but with all of Maui. Our celebrations and our sorrows, our history and our future... Our Jewish place on Maui matters. It matters not only for the Jewish people on Maui- it matters that we show our Maui community that we are vibrant, united, and we have much to offer. Our congregation represents to everyone around us what it means to be Jewish. Let's show a spirit of inclusion, joy, commitment, family, peace, and all the wonderful attributes that we as Jews bring to Maui. Let's all come together to create the shul that will make us proud and will be an example for Jewish communities around the globe. With that, I wish you all a Shabbat Shalom. A textual, philosophical, spiritual and practical interactive discourses on Jewish sources related to the events and holidays of the Jewish calendar. So much of what we hear about Israel, whether on the news or from social media, is confusing and contradictory. But you can learn--from an activist, author, and educator-- how to better interpret what you're reading, and place it in appropriate context. JCM Board of Directors meeting. Open to all members. To celebrate Yom Hazikaron, a lecture by renowned expert on Israel and Arab culture, Mordechai Kedar. This is Dr. Kedar's only Hawaii appearance on his current US speaking tour. The mission of the Jewish Congregation of Maui is to support and inspire Jewish religious and culture practices for Maui residents and visitors, provide and encourage Jewish education and life cycle services; and engage the Jewish community with religious services, classes and events. Click on the link above to shop Amazon, a portion of your purchase will be donated to The Jewish Congregation of Maui.